Rapid Food Distribution allows the Food Bank to distribute highly nutritious, fruits, vegetables and other perishable foods out to our more than 625 agencies at more than 800 sites throughout Los Angeles County. The Food Bank’s refrigerated truck is used to transport fresh, perishable foods to agencies that have very limited refrigeration so that it stays fresh for you and your family. The Food Bank distributes a total of more than 67 million pounds of food annually and 20 percent of that food is produce. Last year we distributed more than 12 million pounds of produce. Launched in 2012, the Mobile Food Pantry has become an important resource for the community. 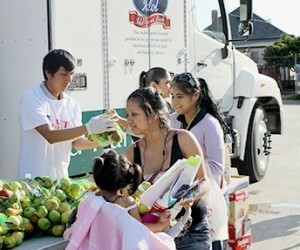 The Mobile Food Pantry serves low-income families in underserved areas throughout Los Angeles County. Food on the refrigerated truck is a combination of produce and perishable goods sourced from the USDA and food donors. In 2017, our Mobile Food Pantry held 150 distributions at 13 sites, providing food for an average of 5,274 unduplicated clients monthly. We delivered a total of 1,422,383 pounds of food (enough for approximately 1,185,319 meals), including 378,987 pounds of fresh produce. 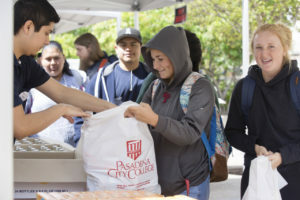 This program also began outreach for college students struggling with food insecurity in 2017.